The industry has been racing to fix Meltdown and Spectre, but aside from writing custom SQL queries or by manually checking each system, how do we face the daunting challenge of determining what systems have the compatible Eraser Engine and which ones do not? Meltdown and Spectre are critical enough vulnerabilities that need to be patched quickly, however, many organizations using Symantec Endpoint Protection continue to struggle identifying whether they have the right Eraser Engine version updates installed to protect their systems. If you applied that security update to systems in your network running SEP, it is possible your systems experienced a Blue Screen (BSOD) STOP error MEMORY_MANAGEMENT (0x1a) because the Microsoft patch conflicts with Symantec’s ERASER (Expanded Remediation And Side Effect Repair) engine. 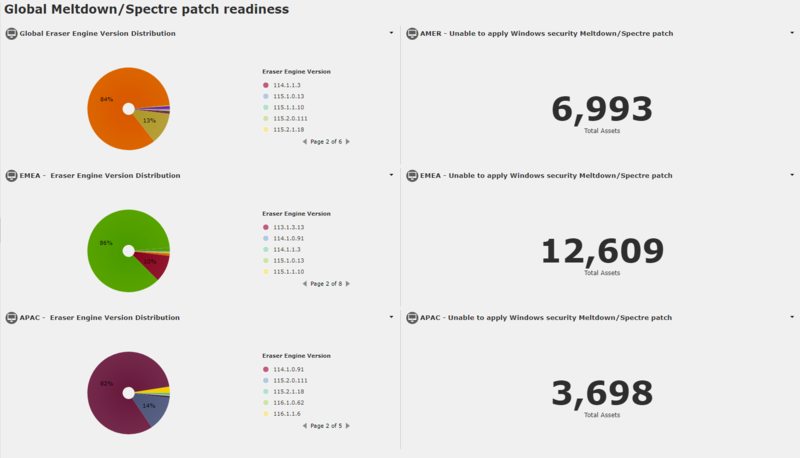 Customers who use SOLVE for SEP are able to quickly and efficiently create dashboards to report on their entire SEP deployment displaying what systems were ready for the Meltdown/Spectre Security Update and which systems needed the Eraser Engine updated first. Here is an example of a SOLVE dashboard we were able to build in less than 30 minutes using live data, so we can keep track of the progress instantly. We divided the dashboard by region for the Americas, Europe, and Asia. On the left, we used donut charts to show the Eraser Engine version distribution. On the right side, we used number boards to display the systems that were running a version of the Eraser Engine older than the compatible version required (117.3.0.358). In order to determine the full magnitude of Spectre/Meltdown and prioritize remediation, it is important to have actionable intelligence and comprehensive real-time visibility across the environment to identify and inventory all known and unknown endpoints to improve your security posture. Stay tuned for future updates, recommendations, and best practices related to Meltdown and Spectre, and for information about how SOLVE can help.